Lady of Egypt by Scientific Games is a superbly designed 10 reel and 9 payline slot. The theme revolves around the last and most beautiful ruler of Ancient Egypt, Cleopatra. This slot game is built differently, consisting of 10 reels, on a horizontal layout, and comes packed with entertaining bonus rounds and features. Now you can launch this game at the best online casino - Vegas Spins on your mobile, desktop or tablet! Symbols you will find landing on the reels of Lady of Egypt are: Cleopatra, Anubis, Bastet, Eagles, Crook and Flail, Snakes, Ankh, A, K, Q and J.
Toggle the + or – buttons on the Bet/Line Field to adjust your stakes. This slot game also gives you the option to use Autoplay, which allows you to play Lady of Egypt slot handsfree! Coin Values: Set your stakes from £0.35 to £175.00. The wild of the game is the Golden Wild, which replaces all other symbols bar the Golden Scarab. This only appears on reels 2, 4, 6 and 8. 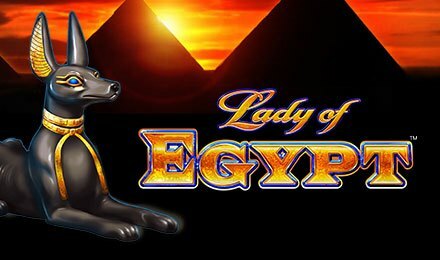 Lady of Egypt slot comes loaded with three jackpots. Mini, Major and Grand, which are triggered at random during your gameplay! Speed Active Reels shift by two reels to trigger expanded pays. Every payline of the game comes built with Speed Spin multiplier of 5x and can be launched anytime. While the symbols shift to reel 10, a winning line or expanded pay is triggered. Seize the chance to grab 10x or 25x if the prize lands on the 10th reel.